Halloween Real Estate Marketing Ideas: A Fall Gift of Spring Flowers! 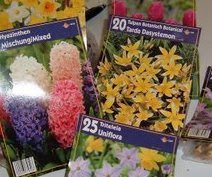 October and November is the time of year that homeowners need to think about spring flowers. This is a great opportunity to thank your recent buyers by gifting them with a bag of spring bulbs. Combine this with October gardening tips and a Halloween or fall-themed thank you card. You could also send the gardening tips to all your real estate contacts via an email or print newsletter.